If you did not know already, lots of drones nowadays come with built in GPS systems. Some of them take a step further and implement both GPS (made by USA) and the Russian satellite positioning system called GLONASS. While the two are very much alike in terms of what they do, GLONASS is more effective for high latitudes where GPS tends to struggle with signal receptions. In other words, if you live in a high latitude area (south or north) it might be a good idea to get a drone that sports both of these systems. Together, they provide you with lightning fast speed and pinpoint accuracy, even on high latitudes. With all of this being said, let’s take a closer look at the Top 10 Drones with GPS / GLONASS that are currently available on the market! Do I need a GPS drone? If you want a rather simple answer to this question, here it comes – Of course you do! Most drones (not counting those cheap toy drones though) nowadays come with GPS, GLONASS or both navigation systems. Why is that so? Well, you’ll find an in-depth explanation down below. For now, let’s just say that GPS brings a lot more functionality to a drone. So, you really shouldn’t commit to a model that doesn’t support it. Even though these 2 were made as direct competition to one another, in reality, they actually complement and improve each other’s results. GPS was made by the USA and GLONASS was made by Russia. They work in a similar way but just via different frequencies. There’s also one more thing to take note of – latitude. That’s the only aspect in which GLONASS is slightly ahead of GPS – it outputs good signal even on the highest of latitudes where GPS usually has issues. Other that, these 2 are pretty much the same. So, if you want to maximize your drone’s positioning and accuracy, make sure to go with a model that features both GPS and GLONASS navigation systems. What is the point of a GPS in GPS drones? The role of GPS in a drone is fairly simple. It is there to feed location data to drone’s software. This, in practice, has a lot of benefits. For instance, GPS in drones enables a lot of those smart features. Sure, some of them can function (to an extent) without GPS; but if the drone has it, chances are those features will work much better. With that being said, let’s see which features in particular greatly benefit from navigational systems. What features does GPS enable? Even though Return To Home feature is available on drones without GPS, it is much more reliable on those who have it. GPS data basically allows the drone to find its way back to the location from which it took off. Waypoints is another great feature enabled solely by GPS. It basically allows you to make a route that your drone will follow. You’ll get to enter height, flying speed, orientation and exact location of each waypoint you set. GPS provides the drone with altitude data enabling it to hold its position accurately for prolonged periods of time. List of Top altitude hold drones is here. This is another smart flight mode that is available on GPS drones. What it does is essentially allow you to select an area close to your drone’s location. With plenty of adjustability provided such as height, speed and camera positioning, you’ll be able to accurately order the drone to circle around your desired area. With everything that has been happening on drone market recently, it is safe to say that Hubsan took the most out of it. They’ve cemented their spots as reliable drone makers with more than a few top-notch models available. That’s why, today we’ll be focusing on H501S, a model that’s insanely affordable, comes with a FHD camera and generally has a lot to offer to potential buyers! 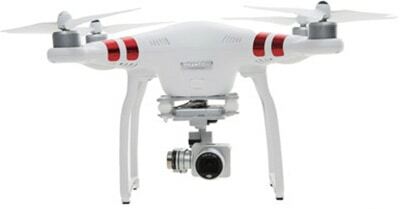 List of Top camera drones is here. First off, I’d like to make one thing clear – H501S is extremely user-friendly. It sports intuitive controls that, in combination with GPS and plenty other smart features, make up for an awesome beginner’s experience. So, if you are planning on buying your first drone ever then Hubsan H501S seems like the perfect choice. 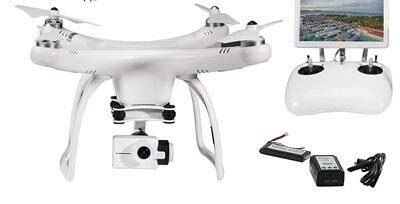 It’s considered as one of relatively affordable drones with GPS and camera. Apart from being beginner friendly, Hubsan H501S has decent specifications too. It runs on a 7.4V 2700mAh LiPo battery which gets it roughly 20 minutes of flight time. Unfortunately, the only drawback is its flight range of only 300 meters. While that’s still reasonable for this range, some of you might have a slight problem with it. If you are looking for a great budget GPS enabled drone then you cannot go wrong with AEE Technology AP9. Unfortunately, it does not come with a camera (unlike the AP10 and AP11 models) but compensates for it with a special mount that is compatible with AEE S-series and GoPro Hero action cameras. In other words, if you already possess an action camera and you want a good bang for the buck drone with GPS capabilities, the AP9 might just be the right one for you. With that out of our way, let’s move on to this bad boy’s specifications! With maximum speed of 44mph and class 3 wind resistance, there is no doubt this little fella is quite speedy and agile. Features such as auto stability, semi-autonomous flight, hover, and automatic position hold, this drone should not be taken for granted. Even more so when you consider its extremely aggressive price tag that most of you will greatly appreciate. Combine all of the above with around 25 minutes of flight time and around 500 meters of distance and you will understand why AP9 is so outstanding across all departments. If you already own a GoPro Hero 3 or 4, then 3DR Solo might be the perfect solution. Why? Well, it doesn’t come with a camera (that’s actually quite obvious considering the first sentence) but with a 3-axis gimbal that supports the above stated GoPro models. True, you can get it working with off brand action cameras too, but it’s a hassle to get it properly set up. Moving forward, 3DR Solo offers roughly 18 to 20 minutes of flight time. That sort of a sweet spot for drones in this price range. Nothing to complain about it. However, the features are where this little fella shines the most. 3DR Solo captures the essence of what a smart drone should do. With a plethora of smart features in combination with your GoPro camera, there’s no doubt it can create aerial masterpieces. In the end, I think I’ve already said enough. There is no need to praise it any further as I am sure all of you already get it – 3DR Solo is an exceptional drone that will most likely exceed all your expectations. UPair did a great job with their newest drone. The starting model comes a bit cheaper but it doesn’t come with a high-quality action camera capable of shooting at 4K. With this in mind, we strongly recommend you splash out a couple of extra bucks and go for the $350 version that packs quite a bit of accessories. There is no doubt that it is a great deal, especially considering you’ll get a 7 inch LED screen on top of the controller (which, by the way, looks really awesome) for FPV monitoring. Alongside a strange build structure and clean nice finish, this drone possesses a great GPS system that provides optimal stability. 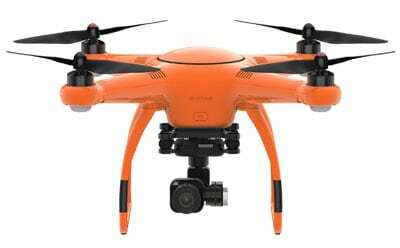 Its camera is on par with more expensive drones in terms of quality and is able to shoot pro quality aerial footage. For about $350 you will get a beautiful looking drone that can travel for around 500 meters without any lag issues, and can be up in the air for almost 20 minutes… 18 to be more precise. All things considered, there’s no doubt that the folk over at Upair did their best with this one… so it’s definitely worth checking out! 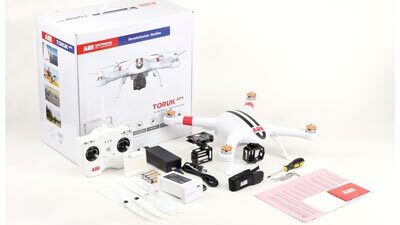 For a straight up price of $400 you will get a beautiful looking drone with the latest in GPS locating systems technology. 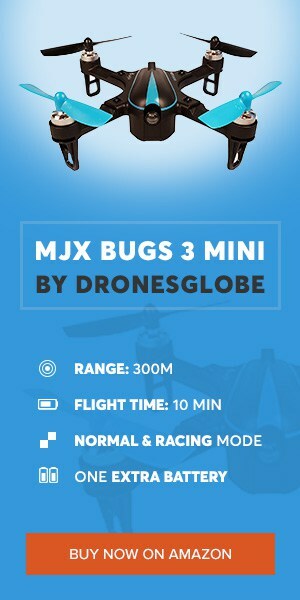 Add in a bunch of useful features such as headless mode, altitude hold, automatic return, follow me (List of drones with gollow me feature) and FPV, and you’ll get yourself an awesome drone for virtually any possible occasion. You think I’m overselling it to you? Pfff, wait till you see what this little fella has to offer and I am sure you will end up changing your mind! Hubsan H109S X4 comes with a full HD camera which is awesome in its own right. I was surprised when I saw the image quality. Although, the image is great not only due to camera quality but to the rotating gimbal as well. It greatly affects the overall smoothness of your aerial shots and makes them appear in a professional manner. Here comes the best part though – the H109S is able to fly up to 25 minutes (yup, that’s right) and can reach close to 1.5 kilometers away from its transmitter… FOR JUST $400… I’ll let that sink in and jump straight to the next drone in this list. The standard edition of DJI’s Phantom 3 drone is bringing a lot of upgrades to the table when compared to the previous series. With amazing build quality (as always) and extraordinary 2.7K action camera, there is no doubt that this little thing packs quite a punch. The GPS systems are directly integrated into its flight, allowing you to concentrate on getting the perfect aerial shots instead of tampering around with flight controls. GPS assists include Point of Interest, Follow me, Waypoints, and Return to Home function. In addition to all of this, the Phantom 3 is able to fly up to 25 minutes on a single full charge and can reach around 1 kilometer of distance away from its transmitter during regular flight, or cca 500 meters if you are using FPV mode. Even though time has taken a toll on some of its features, especially within a direct comparison to DJI P4 Pro, DJI P3 Standard still has a lot to offer. The prices have gone down significantly which is just another reason why you should at least check it out! DJI has unveiled the Spark just a couple of days ago and it is already in the best trending tech gadgets on Amazon. 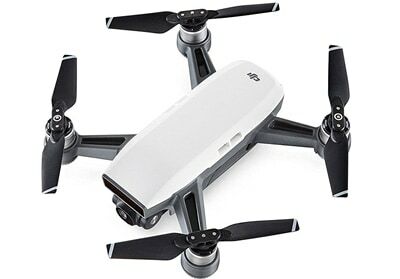 Even though the official release date for Spark (one of the newest drones with GPS and camera) has been set for this summer, DJI Spark is available for preorders and people are massively doing just that. Why is there such a craze for this drone? Well, the obvious reason is that it’s simply awesome. Even smaller than the Mavic Pro and with excellent hardware inside, Spark is ready for a fight against other selfie drones out there. So far, the fight is going heavily in its favor due to seriously sick specifications. We’re looking at roughly 15 minutes of flying and 2 kilometers of supported distance… And all that in a drone not much bigger than your smartphone. On top of all that, this little fella can also brag about state of the art features such as PalmControl and PalmLaunch, among others. If you’re like what you are seeing here, then be my guest and preorder this beauty. From what I can tell you so far, it seems as though DJI made a good move and will enjoy a fair share of success with Spark. Slowly but surely, we are moving forward to the big guns on this list of best GPS drones. The first one is, a serious contender for the best drone of last year. What’s so special about it? Well, it incorporates a sleek, foldable drone design and a whole bunch of raw power underneath the hood. It can fit into pretty much any backpack, which makes it one of the 5 best drones for travel. What’s this awesome drone’s name? People are loving it and they’re not afraid to show it… show it… It’s Mavic Pro and you know it!!! Jokes aside though, Mavic Pro really is a beast. This GPS drone comes with all standard features that this generation of DJI drones support; including ActiveTrack, TapFly and many others. FPV goggles are also quite easy to set up. You can find a thorough guide HERE. Moving forward, this little guy is equipped with a class a 4K camera that has its own dedicated stabilization system. With that in mind, Mavic Pro is not your typical selfie drone, it’s much more than that. As I’ve mentioned above, this drone has some serious power. More precisely, it can travel as far as 7 kilometers and do so within 27 minutes. Wicked, eh? Well, that’s not all! You see, another very important aspect is flight speed. In terms of that, DJI Mavic Pro is standing good at roughly 40 mph. Yuneec has been one of the steadiest players in the drone industry. Every now and then, they introduce us to a great drone that manages to exceed everyone’s expectations. The same can be said about Q500. It’s a great drone across all departments and will surely prove to be a worthy, future-proof tech gadget. Yuneec Q500 4K comes with, as the name suggests, a [email protected] capable camera that is able to shoot full HD in slow motion (@120FPS), which is outright amazing. In addition to all that, it has all the standard GPS drones features such as auto return to home, follow me, waypoints and headless mode. For a drone that costs around $800 but is able to deliver more than 25 minutes of flying and cca 700m distance, it is a pretty solid choice. So, with all that being said, I believe further praises are not needed. It’s already quite obvious what a solid choice Yuneec Q500 is. Excellent build quality and outstanding specifications are leading it to the very top of the market. Kudos to the folk over at Yuneec, they deserve it! 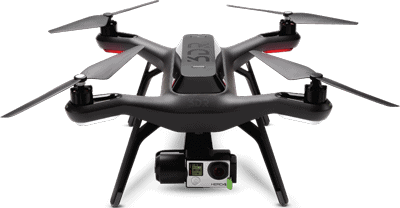 The third 4K drone on this list is, none other than, the X-Star Premium by Autel Robotics. It’s a fairly popular premium drone that has a lot of satisfied users backing it with positive reviews. Despite that, I got a general impression that X-Star Premium is fairly underrated. Why is that so? Well, here’s a glimpse inside this bad boy! 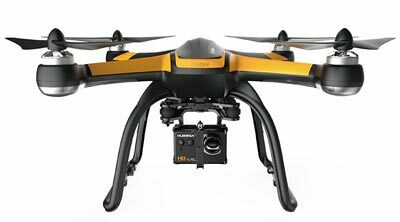 Autel Robotics X-Star Premium sports a clean, robust look breathes quality at every step, making it no surprise that it is able to stand on par with DJI’s works of art. Keep in mind that this little fella has dual positioning systems, both GPS and GLONASS. This makes it amazingly accurate and with the help of SecureFlyTM magnetic interference protection, it is able to travel as far as 2 kilometers with the HD FPV still running with no lag issues. Combine that with a great controller with built-in LCD display for FPV monitoring (it can work with FPV goggles too! ), premium hard case, 64 gigs memory card, and a bunch of spare parts; and you got yourself an amazing piece of tech gadgetry that will surely prove itself useful in all-case scenarios. And the title of the best (and most expensive) GPS drone currently available on the market goes to the amazing DJI Phantom 4 Pro. Considering everything this drone has to offer, there’s no doubt you’re looking at great bang for the bucks. DJI never ceases to amaze us with exceptional drones and this one, quite frankly, is no different. So, let’s see what’s so special about it! When it comes to positioning systems, the Phantom 4 has a pinpoint accuracy along with movement planning, waypoint set up, one key return and even more. As all other premium drones with GPS and camera, this one also comes with a crisp clear 4K action camera that is capable of shooting professional quality aerial footage, not only due to its sheer quality but the motorized gimbal that makes sure the footage is as smooth as possible. And finally, let’s take a closer look at its specifications. With around 7 kilometers of lag-free control range and about half an hour of flight time, the DJI Phantom 4 Pro establishes itself as the best drone on the market… period! High quality comes at a high cost, that’s quite obvious as well… But if you’re someone who needs a state of the art aerial platform, then DJI Phantom 4 Pro is a proper pick! That’s it guys! You have come to the end of our Top 10 Drones with GPS list. It was a hectic one, that’s for sure, especially considering all those premium quality drones on display. As you could see for yourself, there are lots of drones with global positioning systems these days. Among other tasks, these systems provide drones with information about their current position and enable you to map a route for them. You can easily set up waypoints along with autonomous flight that can greatly improve your experience. All things considered, GPS-ready drones offer a lot of functionality on the table, but you still need to decide whether or not you actually need a GPS drone. If you are planning to fly your drone in your house or around the backyard, then you shouldn’t spend a great deal of money for a GPS one. On the other hand, if you want to do professional aerial footage or wish to fly your drone quite far away from you, then GPS / GLONASS systems may be your friends!